With users increasingly searching-shopping-sharing on mobile, businesses have started realising the value of going the app way. In the fear of losing the customers to their mobile-ready counterparts, businesses are trying their best to get on board before their competitors do. But this sense of urgency to jump into the app market has created myths and misconceptions, most of which are based on unfounded assumptions. 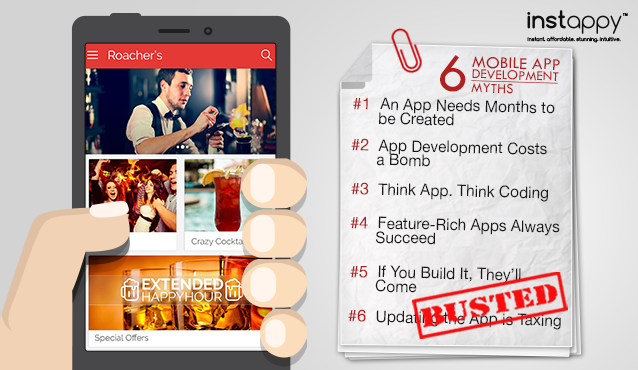 Here we are debunking 6 such myths that keep businesses from taking the mobile leap. According to a survey conducted by Kinvey, it takes as much as 18 weeks to build an app from conception to execution – roughly the same time it takes to drill three 3000 ft. oil wells. Sounds like hard work. Doesn’t it? No wonder, businesses think twice before jumpstarting their mobile app development plans. But the advent of DIY app makers like Instappy has cut the app development time by ten times, right from ideation to implementation. This one has some grain of truth in it. Taking the conventional path of custom app development can prove to be a costly affair. But you can save substantial costs by deploying DIY app building platforms to get your app developed. Adopting the best practices in app designing and development, these platforms make the app creation process much more cost-effective for businesses. Coding and wireframing remain the bottleneck of app creation. Businesses, especially SMEs and start-ups, lack the budget and bandwidth to employ professional designers and developers. Worse yet, Gartner has predicted that by 2017, app market will face an app development demand-supply gap of 5:1. The implication of this app gap is that more and more businesses will switch to RMAD (Rapid Mobile App Development) platforms. Instappy is one such RMAD platform empowering businesses to build fully native apps for iOS and Android without having to hire developers or write a single line of code. Many businesses get so hung up on the features that they end up squandering months and spending hard earned dollars to get them all for their app. But this blind pursuit eventually lead to a steep learning curve and long pre-loading time, and set the app vulnerable to bugs and crashes. And if that’s the case, users won’t think twice before pressing the delete button. The truth is, features won’t fetch your app 5-star ratings, great user experience will. So don’t just create feature-rich apps, create rich experiences. Here’s how. It’s a mobile app, not Noah’s ark. Building a great app doesn’t guarantee success; making serious marketing efforts does! Even Angry Birds and Instagram needed that little marketing nudge to gain traction among target audience. To think that you app will get noticed without marketing is to think that a car will propel itself without fuel. Done right, creative marketing endeavors can catapult your app into limelight, pushing more users to discover and download your app. So create a marketing calendar, plan an App Store Optimisation strategy, and create a buzz around your app even before you set out to launch it in the market. To help you get started, here are 15 creative ways to market your app for free. Many businesses cite app updation as the key reason of not going mobile. The complexity of backend integration involved in updating an app or having to coordinate with a developer is not viable from financial and technical perspective. But if you switch to an app builder that features built-in CMS, you can make unlimited updates, fast and easy, on your own. Instappy is a leading end-to-end solution provider for Rapid Mobile App Development, hosting a galore of fully-customisable, design-driven templates to help you make your app uniquely yours!